The Power of a Whisper - Audiobook | Listen Instantly! "Without a hint of exaggeration," says Bill Hybels, "the ability to discern divine direction has saved me from a life of sure boredom and self-destruction. God's well-timed words have redirected my path, rescued me from temptation and re-energized me during some of my deepest moments of despair." In The Power of a Whisper, vision is cast for what life can look like when God's followers choose to hear from heaven as they navigate life on earth. Whispers that arbitrate key decisions, nudges that rescue from dark nights of the soul, promptings that spur on growth, urgings that come by way of another person, inspiration that opens once-glazed-over eyes to the terrible plight people face in this world - through firsthand accounts spanning fifty-seven years of life, more than thirty of which have been spent in the trenches of ministry, Hybels promotes passion in Christ-followers' hearts for being wide open to hearing from God, and for getting gutsier about doing exactly what he says to do. For more information go to: www.thewhisperwall.com.
" This was an awesome companion to the book. We did this study in our small group and it was very awesome. " " Did a short summer bible study on this book. The author is the minister of a very large congregation of Willow Creek church, located in Chicago. Was good in learning how to listen for those whispers that you may not realize is God trying to talk with you. We all seemed to have whispers to share, so this made it very meaningful.. "
" This was a good book and definitely inspirational, it gave me food for thought and specific encouragement around praying to have a more open ear. Since I go to Willow, I feel like I'd heard most of this in Hybels sermons, so it didn't have that new challenge aspect. " " For those looking to make their calling clear in the kingdom of God I would recommend this. It will give you the tools to figure things out, sort through confusion, and help make things clearer. Good read. " " The Power of a Whisper, by Bill Hybels, affirms a God who is relational, near and wanting to speak to us. In fact, He is speaking, but are we listening? 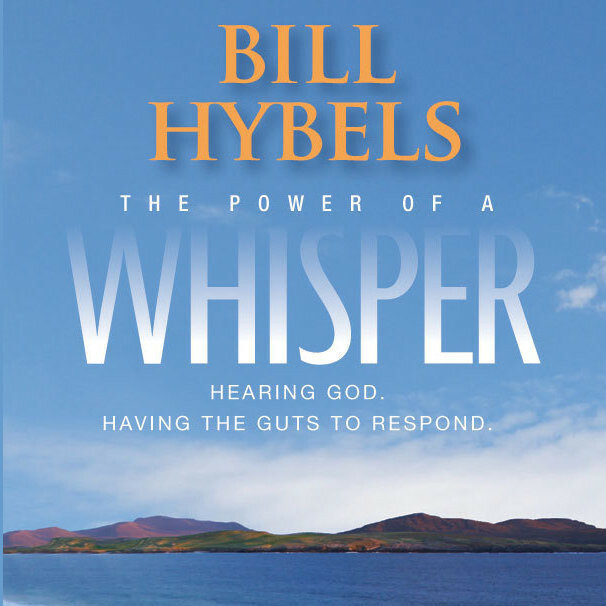 Using many personal stories, Hybels pieces together his story to explain how the whispers of God and His response to them charted a course for his life that he could have never foreseen. God has spoken throughout history and still speaks today to anyone who is willing to listen. Listening to the quiet whispers of God is an extraordinary privilege and certainly the most transforming. This book is well-organized, Scripturally based, helpful and inviting. " " I love Bill Hybels. He is one of my icons. But I have to say that I was a little disappointed in this book of his. It was just good, not great, which is what I expect from him. If you want to be more discerning in "hearing from God" then this is an adequate primer but Wilkinson's book was better. " " easy to read but inspirational. " " Fantastic book. Pastor Hybels is open and reveals much of himself in this book. Lots to think about as we journey with Christ through life and the growth that certainly comes along with it. " " Bill Hybels is blessed with a special ability to connect with his congregation and his readers! " " Designed more for someone who doesn't believe God speaks. Really useless for me, didn't bother finishing it because it was killing my will to read that House of Leaves had finally restored. " " This was a great bible study done as a church wide study...helps you get more attuned to he whispers of God....we all receive them....but do we all hear Him and respond ? " " Great Read! Hybels not only gave great examples from His life, but also backed it up with scripture and gives the readers ideas on how to apply different things to their lives. " " Love this book - same subject as "Walking With God" by Tim Eldridge, but much more practical. It demonstrates how extremely possible it is to hear form God every day and how much our Christian walk depends on God's direction. " " Good premise but too into scripture "
" I read this in a church book club. I had a hard time relating to the author and several other people in the group felt the same way. " " This is a great book about following the promptings of God. Full of stories, a few too many for my tastes, but throughout you find Hybels expert and practical teaching. I appreciated the amount of openness he demonstrated throughout. Great book. " " We read this book as part of a church-wide spiritual campaign - which, as a whole, was good. However, between the videos, the book, and the sermons, I have a hard time rating just the book. However, the book seemed much longer than it needed to be. Excessive explaining, etc. " " Thought provoking read - does God "whisper" to us, telling us what we should do, not do, think, feel etc? Maybe I haven't been listening well enough so I better pay more attention! " " Loved this book! If you ever wondered about hearing God or discerning His voice, this is a must read. Reading this book was like spending hours with a mentor. " " easy to read, lots of short vignettes that apply the concepts. really well written. " " This was our all church study book for Lent. I was mainly annoyed by Mr. Hybels. The first part of the book was ok, and I liked the practical chapter the best. The last part of the book I could take or leave. " " Great content & great writing! I could feel the Lord's hand all over this book. " " Just finished this book and it was excellent. Highly recommend. " " I liked this book. I read it for a Women's Book Club at church, but when the meeting came around, I was too sick to go:( I was really bummed. BUT, I enjoyed the book just the same. It focused me on listening for God in my daily life and encouraged me to get more into the Word. Highly recommended! "